Invisibility is a magical romance between a boy cursed with invisibility and the one girl who can see him. Stephen is used to invisibility. He was born that way. Invisible. Cursed. Then Stephen and Elizabeth meet. To Stephen’s amazement, she can see him. And to Elizabeth’s amazement, she wants him to be able to see her–all of her. But as the two become closer, an invisible world gets in their way–a world of grudges and misfortunes, spells and curses. And once they’re thrust into this world, Elizabeth and Stephen must decide how deep they’re going to go–because the answer could mean the difference between love and death. From the critically acclaimed and bestselling authors Andrea Cremer, who wrote the Nightshade series, and David Levithan, who wrote Every Day and co-wrote Nick and Norah’s Infinite Playlist with Rachel Cohen and Will Grayson, Will Grayson with John Green, as well as many other novels, comes a remarkable story about the unseen elements of attraction, the mortal risks of making yourself known, and the invisible desires that live within us all. He lives just outside New York City. Andrea Cremer and David Levithan met each other in Washington, DC, even though that’s not where they live. Andrea was pretty certain she wasn’t invisible, but David confirmed that fact by introducing her to some other writers, who were all able to see. Books will be available for sale at the event, thanks to the kind folks at Secret Garden Books. This event is free and open to everyone. This entry was posted in Author, Community, Events and tagged author event, author visits, authors, books on May 7, 2013 by pushtotalkteens. I’m addicted to Tamora Pierce. I know, I know — I’m a librarian. Of course I have a book addiction. But I’m talking about true addiction, where I am incapable of reading anything else. I have books coming in for which I’ve been on hold for months, but they get returned unread since I’m completely uninterested! It’s so odd, because I’ve read Tamora Pierce before and this didn’t happen. Folks, when I realized I’d have to put one of the Pierce books on hold, and it was going to take too much time to arrive, I actually bought the book. I never buy books. This entry was posted in Opinions, Read This!, Tidbits and tagged author crush, authors, books on March 8, 2012 by pushtotalkteens. In only two weeks, Patrick Rothfuss will be in Seattle to host a book signing at the University Book Store. For those of you horribly deprived people who have no idea about whom I am talking, I will elaborate. 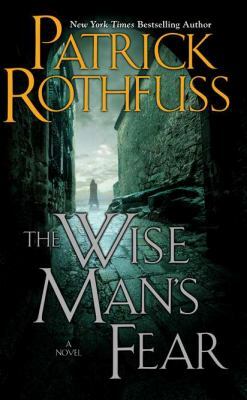 Patrick Rothfuss is a fantasy author whose new book, The Wise Man’s Fear, is coming out on March 1, 2011. This book is a sequel to The Name of the Wind, the first book in an amazingly awesome new fantasy series. Fortunately, there is just enough time left to run out and by Patrick Rothfuss’ first book, in order to be ready for this next one. A highly original story, The Name of the Wind is one of my favorite books, containing great writing and very interesting characters. If you liked books by Robert Jordan, George R.R. Martin, Tad Williams, and many others, you will love Patrick Rothfuss’ books. The signing will be taking place on March 1, a Tuesday, at 7:00. It should be awesome, and I recommend pre-ordering a copy of The Wise Man’s Fear. This entry was posted in Author, Events, Tidbits and tagged authors, book signing on February 22, 2011 by pushtotalkteens.